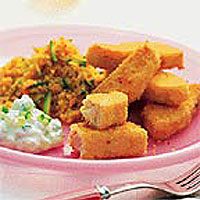 A little salmon goes a long way with this recipe and children will love these home-made fish fingers. To have the skin removed, ask at the Fish Service Counter. Preheat the oven to 200°C, gas mark 6. Mix the breadcrumbs and cheese in a shallow bowl. Place the beaten egg in a shallow dish. Dip the fish fingers into the egg then into the breadcrumb mixture, patting it on well. Arrange the fingers in a single layer on a non-stick baking sheet. Beat the garlic into the butter and dot a little over each finger. Bake in the oven for about 7 minutes then flip the fingers over with a fish slice. Continue to cook for a further 5 minutes or until the fish fingers are golden brown and just cooked through. While the fish is cooking, bring a pan with 400ml cold water to the boil. Add the couscous and simmer for 1 minute. Remove from the heat and stir in the grated vegetables. Cover with a lid and leave for 4 minutes. Stir in the olive oil and serve immediately with the salmon fingers and a little yogurt and cucumber. To save time, use Lurpak Butter with Crushed Garlic in place of the garlic and butter. Use chicken fillets in place of salmon and cook in the same way, but for longer, until the meat is thoroughly cooked and there is no pink meat. Serve with garlic mayonnaise.